Ellen's father: If he loves you as much you love him, he'll make you go. Ellen: You've been so clever, so logical, I've never knew that you handled words so well. Ellen's father: That's not an answer, Elly. Ellen: You weren't quite so logical a few years ago when we needed some boys to ground and get killed or paralyzed. This magnificent film begins with a written prologue as : ¨In all wars , since the beginning of history , there have been men who fought twice . The first time they battled with club , sword or machine gun . The second time they had none of these weapons. Yes , this by far was the greatest battle. It was fought with abiding faith and raw courage and in the end victory was achieved . This is the story of such a group of men . To them this film is dedicated¨ . It deals with an ex-GI named Ken (Marlon Brando who follows the Stalislawski method from Actors' Studio) who as a result of a war wound suffers paralysis and is wheel-bound. In the hospital back home, he is depressed and the isolation young thanks the approval and help of the good Dr. Brock (Everett Sloane) and his former sweetheart Ellen (Teresa Wright) who manage to bring him out of it , as ken gets redeem himself . Ken's depression caused for his paralyzed below the waist is also overcome with the witty friendship of his fellow patients, especially the sly Norm (Jack Webb), the sympathetic Leo (Richard Erdman) and hunk young Angel (Jurado). Soon Ken throws himself into the job rehabilitation and later a long period of physical therapy even suspects he may regain the utilization of his feet. After that , he and Ellen marry, but on their wedding night both have sadness, misgivings and grief about their future , then bitter Ken reverts to self-pity. Ken drives nutty a car and takes place a crash accident . The newspapers publicize : ¨Paraplegics cited for drunk driving¨. Then he goes back to the hospital.. . This is a thoughtful flick with interesting storyline by Carl Foreman relies on wonderful interpretations and slick realization . Subtle performance from Marlon Brando in his screen debut as depressed paralysed young who pass through an initial period of bitterness and sorrow to spontaneous blazed anger and splendid Teresa Wright as his faithful fiancée . Everett Sloane steals the show as intelligent and realist doctor . Marvelous relationship among the main players , both of whom must attempt to build their new life full of difficulties and problems . Furthermore , special mention to ¨ Forty five of the men veterans of Birmingham Administration Hospital ¨. Though the characters and events depicted in this Photoplay are fictitious and similarity to persons , living or dead is purely coincidental. Atmospheric cinematography in black and white by Robert De Grasse A.S.C . Sensible musical score composed and conducted by the classic musician Dimitri Tiomkin. Atmospheric production design by Edward Boyle though is mostly set at a Hospìtal . 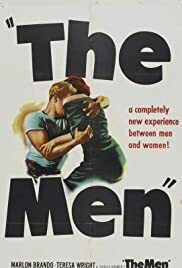 The motion picture well produced by Stanley Kramer - National Film Release- and is stunningly directed by Fred Zinnemann who had a lot of experience from his formers classic films as ¨Act of violence , Seventh cross , Eyes in the night , The search ¨, among them. Rating : Above average . Well worth watching.